The rain misted down and I had two choices: the road up the hill, or the one alongside the river. I stood next to some kind of cement plant, most of it hidden behind a corrugated metal fence dripping with moisture. My pack pulled down on my shoulders. The river, engorged by two days of rain, roared and echoed against the mountains. A man in blue overalls emerged from behind a small Fuso truck. Like many people I’d encountered in Japan, he wanted to help me. I was grateful. I put roughly 25 percent of my Japanese language skills to work. “Sumimasen?” I said (Excuse me). He gestured down the road, I thought along the river. He said quite a few things that I didn’t understand. I thanked him and strode off, pack on back, hands on straps, rain on head. A half-hour later, after continuing along the river and then beneath a highway overpass, pressing against the wall because there was no shoulder, and then doubling back in confusion — this can’t be right — I found myself outside the same plant, beside the same fence, talking to the same man. He seemed mildly frustrated with me. He gestured again, and this time I went up the hill. Of course — when you have a pack on your back, the destination is always up the hill. I soon came into Tsumago, a beautifully preserved Edo-era town on the Nakasendo road in the Kiso Valley. I had wanted to visit for years — 35, actually — and had chosen to walk from the train so I could first experience the town as travelers had in the 19th century: on foot, the neat rows of wooden houses revealing themselves in diminishing perspective as I turned the corner. But it was 2011, so instead I entered via the parking lot, and had to negotiate my pack between an idling bus and a pair of vending machines featuring the image of Tommy Lee Jones. The evening after my rainy wrong turn I clumped eagerly up the road from Tsumago to the town of Magome. I was in some kind of heaven that day, in either bright sunshine or cool, crisp shade, but was rarely out of earshot of a highway. 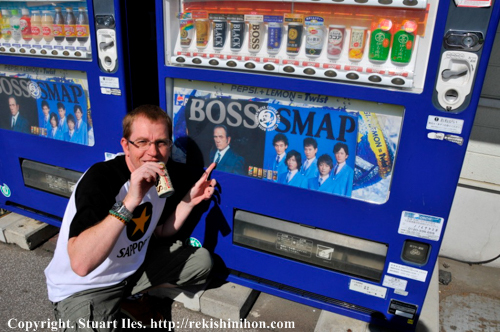 At one point, deep in the woods, I encountered a vending machine (Tommy Lee Jones again). I had an iced coffee. So I faced my next dilemma, what was next? And so I chose the Kumano Kodo, a series of trails through deep forest and small towns on the Kii Peninsula several hours south of Osaka. It’s a religious pilgrimage that I came across in my obsessive reading. Pilgrims go to visit the numerous shrines along the way, worshiping the mountains themselves. They’ve done so since the sixth century. It’s said one can achieve spiritual powers by enduring the route’s physical challenge. Spirituality aside, this seemed to have everything I wanted: long walks deep in the woods, beautiful towns with little hotels promising hot baths, sake and great meals. The idea of going alone was intimidating (I could only imagine how little English was spoken) but I hated the idea of being part of a group with a guide. My Japanese obsession is a very private thing. Kumano Kodo walking track map. At my inn in Kyoto, I got my 12-page itinerary, a booklet detailing the Kumano Kodo with directions (I would be taking the Nakahechi route) and several beautiful laminated color maps with height elevations. I was all set. The next morning, having condensed my essentials and a few of my favorite books about Japan into a shoulder bag, I grabbed a boxed lunch at Kyoto Station and got on the Super Kuroshia No. 7 limited express, nonreserved car, as per my instructions. I studied my itinerary and maps as the outskirts of Kyoto and then Osaka gave way to small towns and finally, the blue expanse of the Inland Sea, dotted with tiny islands as jagged and numerous as those portrayed by Hiroshige. The train hugged the west coast of the peninsula before arriving at the town of Kii-Tanabe, where I got off and found the bus that would take me into the interior. As I got on, I noticed a group of Westerners who seemed to be following the same instructions. This was something I had not considered: Others would be taking the same self-guided tour at the same time and I would be, by default, part of a group. The bus climbed away from the cluttered coastline into rich green mountains, and eventually along a wide, pebbly river. Soon enough, and right on time, we were in Takijiri, a tiny town in a deep ravine at the intersection of the Tonda and Ishifune rivers where the Kumano Kodo begins. I paid the 960 yen and went into a shop to get water and a bamboo walking stick. I also wanted to let the others get ahead of me. I followed my instructions. The first shrine, Takijiri oji, was just behind the shop. I walked toward it, and then to the left around it, and saw the beginning of the trail, a sharply ascending ladder of logs and tangled tree roots, slick with damp leaves, beside a steep drop-off. Up I went. Have I mentioned that I’m not much of a hiker? Beyond my Japanese-fencing phase, athletics have never been a priority. I’m not outdoorsy; I’m indoorsy. But my Hiroshige fantasy propelled me onward, even as my chest started to ache awfully soon. I’m also a little anxious about heights. This was an issue that first day, and on the subsequent two days, as the trail was often atop a towering cliff on the right side, the left side, or at a few spots, both sides, the path crowning a precipitous land bridge. At one point, I kicked a small rock to determine how long it would take to the reach the bottom. It was still bouncing down, on and on, more and more distant, when I resumed my trek. 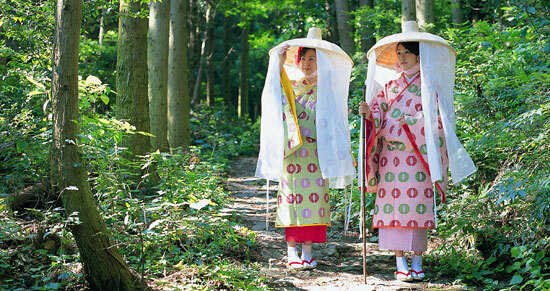 Many people dress up in pilgrimage outfits. I got into a rhythm, marking my progress on my map and at every wooden trail marker. My info guide explained the history and legends associated with this or that shrine or landmark, kept me from taking several wrong turns, and warned me away from a detour that, while promising a great view, would have been exhausting. And anyway, there were already views at every break in the trees — layers and layers of mountains, some smooth, others rough with treetops, their ridges meeting in diagonal lines, each a different shade of green-blue. The first day was only 2.8 miles. Soon I descended into the tiny town of Takahara. Here two roads met on a gliding slope, and there were a few shops and one hotel, the Organic Hotel Takahara Kiri-no-sato. Every room in the place, from the wide-open lobby-dining room with its bare support beams to the men’s and women’s baths to the bedrooms, had spectacular views of the yawning valley below, now tinted gold. I tossed my bag in my room and went to have a beer and take some notes on the terrace. The afternoon cooled: The instant the sun dipped behind the mountains, it felt as if the valley became air-conditioned. I found the group from the bus, beers half-empty, one of the women with a laptop, and discovered that after my solitary train-bus-walk day, I didn’t mind a little company. After a bit I went for a bath, joined in the wooden tub by two chatty and elderly Japanese men, and enjoyed the view of the darkening mountains some more before getting dressed for dinner, set for precisely 6:30 p.m.
One member of the group, Janet, invited me to sit with them, and I liked the idea, but my hosts said this would be impossible: We were different parties, after all. Sometimes in Japan, I’ve found, rules can be intractable. So I ate alone — pickles, beef I dipped in boiling water, and several other items including a very western avocado dish — at the next table over, my back to the others. It was equal parts awkward and comic. “How are you doing over there, Wendell,” Janet asked at one point over her shoulder. The rules were relaxed as the meal ended, and I shifted my chair around and joined the other table as I finished my sake. There were five of them: Janet; her husband, Stan; her aunt Elvina; her colleague Pat; and Pat’s friend, also named Pat. We traded the basic details of our lives. They were from Canada, Edmonton and Vancouver, with jobs that included judges and lawyers in family court. It made for fascinating after-dinner conversation. They were also fierce hikers, having tackled many ambitious walks, such as the Camino de Santiago in Spain. They were indeed following Oku’s instructions, and had found the first day’s walk a snap. “Have you seen the elevations for tomorrow, and the day after?” one asked me. I had and said that I was worried. The second day’s hike was 6.5 miles, including 1,575 feet of ascent. I went down to the village to take in the view from there, and to allow the Canadians to get a head start; I still envisioned my hike as a solitary adventure. Soon enough I was deep in the woods, marveling at the towering and straight-up Japanese cedars and passing an abandoned house that looked like something out of a Japanese horror movie. Some trees were flecked with early-autumn orange. I sat on a stump to eat two sandwiches the Organic Hotel had packed for me for lunch. At one point I paused beside an especially deep ravine. The cedars stood like an infinite army of stoic and towering sentries all around and above and below me, endless legions of them, falling away on my hill and then rising higher on the next one, their tops shimmering gently way, way up there in the occasional breeze. A few beams of sunlight slanted down, but otherwise all was in shade. There wasn’t a sound, not a bird, not a cricket; even the branches swaying in the breeze could not be heard, as if they were in a silent movie. My hiking senses sharpened. I came to learn that a glimpse of blue sky near the bottom of the trunks ahead meant I was reaching the crest of a mountain, just as the increasingly loud gurgle of a stream meant I was reaching the bottom. There always seemed to be more up than down. 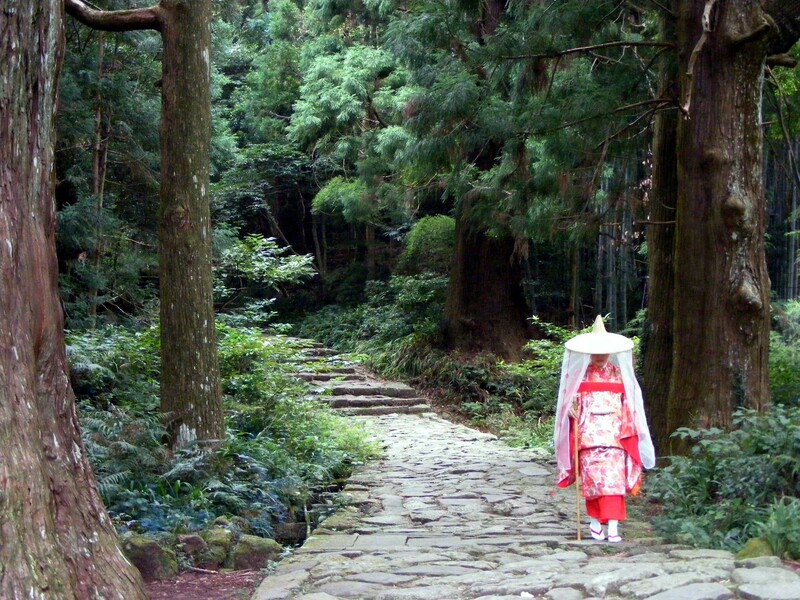 Many Japanese pilgrims on these walks. I was warned that the Kii Peninsula could be rainy, but I never had anything but sun. My stamina followed an arc: I tired quickly, then got into a rhythm, magically energized. I felt my mind open up and go free — it wandered through time, over that print show at the Cooper Hewitt, my family, my first trip to Japan, even my job: Solutions to several vexing problems at work suddenly became clear. I tired again as I approached my destination, the town of Chikatsuyu, a minshuku awaited me, more modest than a traditional Japanese inn. It sat on the far bank of the Tonda. I had another long, hot bath, this one fed by a hot spring, again with two chatty and elderly Japanese men, though not the same ones as the evening before. I threw in once and for all with the Canadians at dinner. Maybe I’d already tired a little of my own thoughts. We agreed to stick together the next day. Another group at the guesthouse was from Spain, including a stocky bald man said to be a karate expert. We started early the following morning — Elvina was soon way ahead — and marked our progress on our maps. We had lunch in a small field next to a stream: I had two rice balls I’d bought at a shop in Chikatsuyu and an egg that Elvina made me take from the hotel, saying she was worried I wouldn’t have enough for lunch. We saw some wildlife. A snake zipped between the feet of one of the Pats. Three monkeys ruffled branches down a hill, warning us off with ghastly shrieks. And a deer with two short, single-pronged antlers and a straight-up white tail froze on the trail ahead of us. I reached for my camera but not quickly enough: the karate master bounded up from behind — “Qué pasa?” — and the deer bolted into the cedars as if it had been launched from a catapult. The Canadians paid more attention to hiking times and progress than I did. I learned a lot from them, like how each of the many shrines we passed had a small box containing a stamp and an ink pad. Or how I shouldn’t swing my hands when I hiked, because they could become swollen. In return I shared some of the many small facts I’d picked up about Japan in my decades of reading, like that the soft-boiled egg with a velvety texture that we’d had at breakfast was an “onsen egg” cooked in a hot spring. “Where did you learn that?” Janet asked me. That day’s hike was the longest at nine miles with roughly 2,000 feet of ascent. I was glad for that extra egg. This was the moderate option which included a quick bus ride. There was an easier option with a longer bus ride but that felt like cheating. Eventually, we came out of the forest and walked along paved roads in little farming towns. 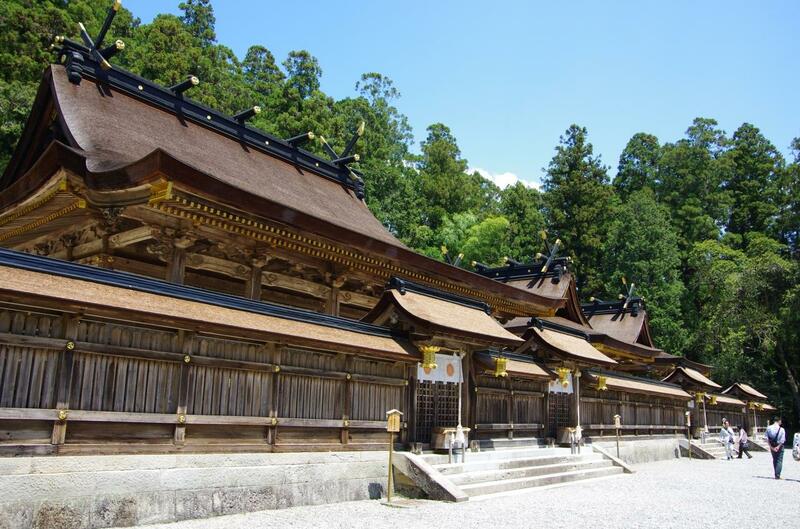 The hike ended in the magnificent Grand Shrine at Hongu, a key stop for many of those mountain-worshiping pilgrims. The shrine’s low-slung wooden buildings sat atop a towering stone staircase limned by hundreds of white flags blazing with Japanese characters, a fittingly dramatic finale. That night’s accommodation was a modern hot springs hotel. I had a bottle of Kirin from the refrigerator in my room before sampling all the various sulfur-smelling baths. I bathed inside, I bathed outside, and after a farewell dinner with the Canadians, found one of two private baths unoccupied, so I bathed there, too, finally alone. These baths were in a little house, the damp wood wall that separated them open near the ceiling. Two Japanese women — a mother and a daughter, I suspect — had gone into the other one as I went into mine, and I listened groggily in the near darkness to their mellifluous words and laughter, and occasional tiny splashes, as I sat in the steaming water up to my neck. If Hiroshige could see me now. My second trip made it all feel more real. The fantasy Japan of color woodblock prints and black-and-white movies was being replaced by the actual country. Those little encounters, with the gang at the Golden Gai bar, the hiker from Indiana, the men in the baths, a friend I met for lunch at Tokyo Station on my two-day race back to Narita Airport and home, brought Japan ever so slightly into focus. Hiroshige probably never visited the Kii Peninsula. In fact, recent scholarship suggests he never even traveled the length of the Tokaido, creating some of his most famous designs from guidebooks. I don’t know and I don’t care: I’m certain that in those solitary moments deep in the woods, my mind free, the cedars like endless rows of sentries, as I walked a path worn smooth by pilgrims 1,400 years ago, the silence complete, enveloping, I saw him. Words by Wendell Jamieson edited and photos added by Stuart Iles. Next Post Escaped convicts first ever Australian ship to Japanese waters.